Flat feet are a common problem. They can easily be identified by even non-trained individuals as the appearance is quite clear. On the inside of the foot should be a nice curvature which raises the inner foot up off the floor. If the foot touches the floor consistently from heel to toes then the foot is considered flat. Flat feet are a common condition. In infants and toddlers, the arch is not developed and flat feet are normal. The arch develops in childhood. By adulthood, most people have developed normal arches. When flat feet persist, most are considered variations of normal. Most feet are flexible and an arch appears when the person stands on his or her toes. Stiff, inflexible, or painful flat feet may be associated with other conditions and require attention. Painful flat feet in children may be caused by a condition called tarsal coalition. In tarsal coalition, two or more of the bones in the foot fuse together. This limits motion and often leads to a flat foot. Most flat feet do not cause pain or other problems. Flat feet may be associated with pronation, in which the ankle bones lean inward toward the center line. When the shoes of children who pronate are placed side by side, they will lean toward each other (after they have been worn long enough for the foot position to remodel their sole). Foot pain, ankle pain, or lower leg pain (especially in children) may be a result of flat feet and should be evaluated by a health care provider. Adults can develop a flat foot when they are 60 - 70 years old. This type of flat foot is usually on one side. Not everyone who has flat feet experiences symptoms. Others, however, feel persistent pain in their feet and wearing shoes can prove additionally painful. Others only feel symptoms when they walk more than normal, go jogging or participate in a sport that involves running or kicking. If fallen arches are not causing any pain or discomfort, then they will not need any treatment. If they were causing a persistent pain in the feet, or in the hips, legs or knees, then it would be best to consult your family doctor. Walking is the natural activity of feet and if it is not too painful, sufferers should walk as much as possible to strengthen their arches. When it is possible, go barefoot, or wear soft flexible shoes. In cases of severe fallen arches, your doctor may recommend special shoe inserts. Fallen arches may occur with deformities of the foot bones. Tarsal coalition is a congenital condition in which the bones of the foot do not separate from one another during development in the womb. A child with tarsal coalition exhibits a rigid flat foot, which can be painful, notes the patient information website eOrthopod. Surgery may prove necessary to separate the bones. Other foot and ankle conditions that cause fallen arches may also require surgery if noninvasive treatments fail to alleviate pain and restore normal function. what happens if one leg is shorter than the other? Heel pain is one of the most common conditions to affect the foot. It is usually felt as an intense pain when the affected heel is used. The pain is usually worse when you get out of bed in the morning or after a long period of activity. In most cases, only one heel is affected. After walking, the pain usually improves. However, it is common for it to be painful when you first take a step after a period of rest. The pain often worsens by the end of the day. Most cases of heel pain are caused by damage and thickening of the plantar fascia. Sometimes, the surrounding tissue and the heel bone also become inflamed (swollen). If you still have pain after several weeks, see your foot and ankle surgeon, who may add one or more of these treatment approaches, padding and strapping. Placing pads in the shoe softens the impact of walking. Strapping helps support the foot and reduce strain on the fascia. Orthotic devices. Custom orthotic devices that fit into your shoe help correct the underlying structural abnormalities causing the plantar fasciitis. Injection therapy. In some cases, corticosteroid injections are used to help reduce the inflammation and relieve pain. Removable walking cast. A removable walking cast may be used to keep your foot immobile for a few weeks to allow it to rest and heal. Night splint. Wearing a night splint allows you to maintain an extended stretch of the plantar fascia while sleeping. This may help reduce the morning pain experienced by some patients. Physical therapy. Exercises and other physical therapy measures may be used to help provide relief. Morton's neuroma is a condition that affects one of the nerves that run between the long bones (metatarsals) in the foot. The exact cause is not certain. Symptoms include pain, burning, numbness and tingling between two of the toes of the foot. About a quarter of people just need simple treatments including modification of their footwear. Sometimes surgery is needed for long-standing (chronic) symptoms. People with Morton's neuroma usually complain of pain that can start in the ball of the foot and shoot into the affected toes. However, some people just have toe pain. There may also be burning and tingling of the toes. The symptoms are usually felt up the sides of the space between two toes. For example, if the nerve between the third and fourth long bones (metatarsals) of the right foot is affected, the symptoms will usually be felt up the right-hand side of the fourth toe and up the left-hand side of the third toe. Some people describe the pain that they feel as being like walking on a stone or a marble. Symptoms can be made worse if you wear high-heeled shoes. The pain is relieved by taking your shoe off, resting your foot and massaging the area. You may also experience some numbness between the affected toes. Your affected toes may also appear to be spread apart, which doctors refer to as the 'V sign'. The symptoms can vary and may come and go over a number of years. For example, some people may experience two attacks of pain in a week and then nothing for a year. Others may have regular and persistent (chronic) pain. You might first seek advice from your family doctor about your foot pain. He or she may refer you to a doctor or surgeon who specializes in foot disorders. Before your appointment, you may want to write a list of answers to the following questions. When did your symptoms begin? Did your symptoms begin gradually or suddenly? What type of footwear do you wear for work? Do you participate in sports? If so, what types in particular? What medications and supplements do you take regularly? Your doctor may ask some of the following questions. Is the pain worse in certain pairs of shoes? Does any type of activity ease the pain or worsen it? Are you having pain in any other part of your body? Common treatments involve wearing different shoes or using arch supports. Resting the foot, massaging the toes and using an ice pack may work for some people. A GP or a podiatrist (foot specialist) may also recommend anti-inflammatory painkillers or a course of steroid injections. Numbing injections, in which alcohol and a local anaesthetic are injected into the affected area of the foot, may also be effective. In extreme cases, when the condition does not respond to treatment, day case surgery may be needed. Surgery for neuroma most often involves removing affected nerve in the ball of the foot. An incision is made on the top of the foot and the nerve is carefully removed. Surgeon must remove the nerve far enough back so that the nerve doesn?t continue to become impinged at the ball of the foot. Alternatitvely, another type of surgery involves releasing a tight ligament that encases the nerve. Recovery after Morton?s neuroma (neurectomy) surgery is generally quick. Typically patients are walking on the operated foot in a post-surgical shoe for 2 - 4 weeks, depending on healing. Return to shoes is 2-6 weeks after the surgery. Factors that may prolong healing are age, smoking, poor nutritional status, and some medical problems. There are actually two different kinds of leg length discrepancies, congenital and acquired. Congenital indicates you are born with it. One leg is anatomically shorter compared to the other. Through developmental periods of aging, the brain picks up on the step pattern and identifies some variance. Your body usually adapts by dipping one shoulder to the "short" side. A difference of under a quarter inch is not really irregular, demand Shoe Lifts to compensate and usually does not have a serious effect over a lifetime. Leg length inequality goes typically undiagnosed on a daily basis, however this condition is very easily fixed, and can eradicate a number of incidents of back ache. Therapy for leg length inequality commonly consists of Shoe Lifts. These are cost-effective, regularly costing below twenty dollars, compared to a custom orthotic of $200 or more. When the amount of leg length inequality begins to exceed half an inch, a whole sole lift is generally the better choice than a heel lift. This prevents the foot from being unnecessarily stressed in an abnormal position. Low back pain is the most prevalent ailment affecting people today. Over 80 million people are afflicted by back pain at some stage in their life. It's a problem which costs employers millions of dollars year after year on account of time lost and output. Fresh and superior treatment methods are constantly sought after in the hope of decreasing the economical impact this issue causes. Men and women from all corners of the world experience foot ache as a result of leg length discrepancy. In most of these cases Shoe Lifts can be of very beneficial. The lifts are capable of reducing any pain in the feet. Shoe Lifts are recommended by countless expert orthopaedic physicians. In order to support the body in a healthy and balanced manner, feet have a vital task to play. Inspite of that, it can be the most neglected region in the human body. Some people have flat-feet which means there is unequal force placed on the feet. This will cause other parts of the body including knees, ankles and backs to be affected too. Shoe Lifts ensure that ideal posture and balance are restored. There are actually two unique variations of leg length discrepancies, congenital and acquired. Congenital indicates that you are born with it. One leg is anatomically shorter in comparison to the other. As a result of developmental stages of aging, the brain picks up on the gait pattern and identifies some difference. The human body typically adapts by tilting one shoulder to the "short" side. A difference of under a quarter inch isn't very abnormal, doesn't need Shoe Lifts to compensate and usually won't have a serious effect over a lifetime. Leg length inequality goes largely undiagnosed on a daily basis, yet this issue is simply remedied, and can reduce many instances of back discomfort. Treatment for leg length inequality usually involves Shoe Lifts. These are low cost, normally priced at less than twenty dollars, in comparison to a custom orthotic of $200 plus. Differences over a quarter inch can take their toll on the spine and should probably be compensated for with a heel lift. In some cases, the shortage can be so extreme that it requires a full lift to both the heel and sole of the shoe. Lumbar pain is easily the most prevalent health problem affecting men and women today. Around 80 million men and women are affected by back pain at some stage in their life. It is a problem which costs businesses huge amounts of money every year because of time lost and output. New and more effective treatment methods are continually sought after in the hope of reducing the economic influence this issue causes. People from all corners of the earth experience foot ache due to leg length discrepancy. In these types of situations Shoe Lifts are usually of very helpful. The lifts are capable of reducing any discomfort in the feet. Shoe Lifts are recommended by countless skilled orthopaedic orthopedists. To be able to support the body in a balanced fashion, the feet have got a significant job to play. Irrespective of that, it can be the most neglected zone in the human body. Many people have flat-feet which means there may be unequal force exerted on the feet. This will cause other body parts like knees, ankles and backs to be impacted too. Shoe Lifts make sure that correct posture and balance are restored. Sometimes, the big toe can become angled outwards towards the middle of the foot and second toe. This forces the top of the first metatarsal to stick out from the side of the foot at the base of the big toe. If this happens, the bones can become misaligned and a painful bunion can form. It is not known exactly what causes bunions, but wearing badly fitting shoes is thought to make the condition worse. Research also suggests that bunions may run in families. It is thought that bunions are more likely to occur in people who have unusually flexible joints, and that this flexibility may be inherited. In some cases, certain health conditions, such as rheumatoid arthritis and gout, may also be responsible for the formation of bunions. These conditions cause pain and inflammation in the joints. Bunions are most often caused by faulty foot mechanics. It is not the bunion itself that is inherited, but certain foot types that make a person prone to developing a bunion. Although wearing shoes that crowd the toes won't actually cause bunions in the first place, it sometimes makes the deformity progressively worse. That means you may experience symptoms sooner. Look for an angular, bony bump on the side of the foot at the base of the big toe. Sometimes hardened skin or a callus covers this bump. There's often swelling, redness, unusual tenderness, or pain at the base of the big toe and in the ball of the foot. Eventually, the area becomes shiny and warm to the touch. Seek medical advice if you have persistent pain when walking normally in otherwise comfortable, flat-soled shoes, you may be developing a bunion, bursitis, or a bone spur in your foot. Generally, observation is adequate to diagnose a bunion, as the bump is obvious on the side of the foot or base of the big toe. However, your physician may order X-rays that will show the extent of the deformity of the foot. Fortunately, many bunions never go on to cause problems other than the cosmetic appearance. The easiest option is to try different shoes or padding, however this is not the answer for everyone. The various straps and braces that are commercially available are not proven to be particularly effective. There are a number of different surgical procedures used to treat bunions. The type of surgery recommended for you will depend on the severity of the deformity. Your surgeon may use pins, wires or screws to hold the bones in place while they heal. Depending on the type of surgery you have, these may be left in your foot or removed later on. Some of the surgical procedures for bunions are described below. Osteotomy is the most commonly used and proven type of bunion surgery. Although there are many different types of osteotomy, they generally involve cutting and removing part of the bone in your toe. During the procedure, your surgeon will remove the bony lump and realign the bones inside your big toe. They'll also move your toe joint back in line, which may involve removing other pieces of bone, possibly from the neighbouring toes. A procedure called distal soft tissue realignment may be combined with an osteotomy. This involves altering the tissue in your foot to help correct the deformity and improve the stability and appearance of the foot. Does Posterior Tibial Tendon Dysfunction (PTTD) Always Require Surgery Teatment ? Adult flatfoot (adult acquired flatfoot) or posterior tibial tendon dysfunction (PTTD) is a common pathology presented to foot and ankle specialists. PTTD is characterized by a valgus (everted) hindfoot, flattening of the longitudinal arch of the foot (collapse) and abduction of the forefoot. This is a progressive deformity that begins flexible and can become rigid over time. The posterior tibial tendon (PT) is one of the main supporting structures of the foot arch. Changes within this tendon cause flattening of the foot. There are four stages of this deformity that begins flexible and progressives, with no treatment, to a rigid deformity and with time may involve the ankle joint. Patients usually present with pain in the foot or ankle stating the ?ankle? is rolling. It?s also common for patients to state they have difficulty walking barefoot. Pain is exacerbated after physical activities. Pain is usually isolated to the inside of the foot along the course of the PT tendon. Many health conditions can create a painful flatfoot, an injury to the ligaments in the foot can cause the joints to fall out of alignment. The ligaments support the bones and prevent them from moving. If the ligaments are torn, the foot will become flat and painful. This more commonly occurs in the middle of the foot (Lisfranc injury), but can also occur in the back of the foot. In addition to ligament injuries, fractures and dislocations of the bones in the midfoot can also lead to a flatfoot deformity. Conservative treatment also depends on the stage of the disease. Early on, the pain and swelling with no deformity can be treated with rest, ice, compression, elevation and non-steroidal anti-inflammatory medication. Usually OTC orthotic inserts are recommended with stability oriented athletic shoes. If this fails or the condition is more advanced, immobilization in a rigid walking boot is recommended. This rests the tendon and protects it from further irritation, attenuation, or tearing. If symptoms are greatly improved or eliminated then the patient may return to a supportive shoe. To protect the patient from reoccurrence, different types of devices are recommended. The most common device is orthotics. Usually custom-made orthotics are preferable to OTC. They are reserved for early staged PTTD. Advanced stages may require a more aggressive type orthotic or an AFO (ankle-foot orthosis). There are different types of AFO's. One type has a double-upright/stirrup attached to a footplate. Another is a gauntlet-type with a custom plastic interior surrounded be a lace-up leather exterior. Both require the use of a bulky type athletic or orthopedic shoes. Patient compliance is always challenging with these larger braces and shoes. Many operations are available for the treatment of dysfunction of the posterior tibial tendon after a thorough program of non-operative treatment has failed. The type of operation that is selected is determined by the age, weight, and level of activity of the patient as well as the extent of the deformity. The clinical stages outlined previously are a useful guide to operative care (Table I). In general, the clinician should perform the least invasive procedure that will decrease pain and improve function. One should consider the effects of each procedure, particularly those of arthrodesis, on the function of the rest of the foot and ankle. Adult Aquired Flat Feet Do I Suffer From AAF? Adults with an acquired flatfoot deformity may present not with foot deformity but almost uniformly with medial foot pain and decreased function of the affected foot (for a list of causes of an acquired flatfoot deformity in adults. Patients whose acquired flatfoot is associated with a more generalised medical problem tend to receive their diagnosis and are referred appropriately. However, in patients whose adult acquired flatfoot deformity is a result of damage to the structures supporting the medial longitudinal arch, the diagnosis is often not made early. These patients are often otherwise healthier and tend to be relatively more affected by the loss of function resulting from an acquired flatfoot deformity. The most common cause of an acquired flatfoot deformity in an otherwise healthy adult is dysfunction of the tibialis posterior tendon, and this review provides an outline to its diagnosis and treatment. As the name suggests, adult-acquired flatfoot occurs once musculoskeletal maturity is reached, and it can present for a number of reasons, though one stands out among the others. 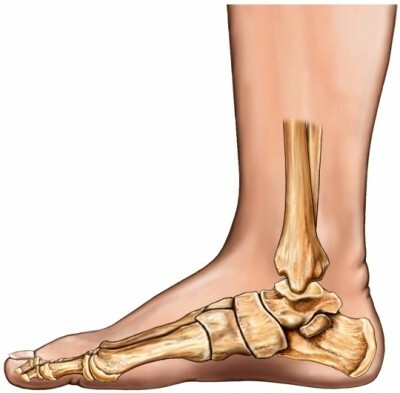 While fractures, dislocations, tendon lacerations, and other such traumatic events do contribute to adult-acquired flatfoot as a significant lower extremity disorder, as mentioned above, damage to the posterior tibial tendon is most often at the heart of adult-acquired flatfoot. One study further elaborates on the matter by concluding that ?60% of patients [presenting with posterior tibial tendon damage and adult-acquired flatfoot] were obese or had diabetes mellitus, hypertension, previous surgery or trauma to the medial foot, or treatment with steroids?. In many cases, adult flatfoot causes no pain or problems. In others, pain may be severe. Many people experience aching pain in the heel and arch and swelling along the inner side of the foot. Starting from the knee down, check for any bowing of the tibia. A tibial varum will cause increased medial stress on the foot and ankle. This is essential to consider in surgical planning. Check the gastrocnemius muscle and Achilles complex via a straight and bent knee check for equinus. If the range of motion improves to at least neutral with bent knee testing of the Achilles complex, one may consider a gastrocnemius recession. If the Achilles complex is still tight with bent knee testing, an Achilles lengthening may be necessary. Check the posterior tibial muscle along its entire course. Palpate the muscle and observe the tendon for strength with a plantarflexion and inversion stress test. Check the flexor muscles for strength in order to see if an adequate transfer tendon is available. Check the anterior tibial tendon for size and strength. Although AAF is not reversible without surgery, appropriate treatment should address the patient?s current symptoms, attempt to reduce pain, and allow continued ambulation. In the early stages, orthotic and pedorthic solutions can address the loss of integrity of the foot?s support structures, potentially inhibiting further destruction.3-5 As a general principle, orthotic devices should only block or limit painful or destructive motion without reducing or restricting normal motion or muscle function. Consequently, the treatment must match the stage of the deformity. What Can Cause Achilles Tendonitis Pain ? Inflammation of the Achilles tendon.The Achilles is the large tendon connecting the two major calf muscles, gastrocnemius and soleus, to the back of the heel bone. Under too much stress, the tendon tightens and is forced to work too hard. This causes it to become inflamed (that is tendinitis), and, over time, can produce a covering of scar tissue, which is less flexible than the tendon. If the inflamed Achilles continues to be stressed, it can tear or rupture. Tendinitis typically develops after abrupt changes in activity or training level, use of poorly fit or worn footwear, or training on uneven or dense running surfaces. Overuse prior to sufficient training is generally the cause. This is due to forces 8-10 times the body weight acting on the tendon during physical activity. 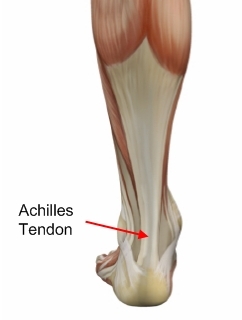 Achilles injuries range from inflammation to a breakdown in the tendon. Pain is generally felt low on the back of the heel due to the low vascularity and susceptibility for inflammation. Pain higher on the Achilles is generally more muscular pain and less tendonitis. If swollen spots or knots are found along the tendon, or if the tendon feels jagged, cease activity and seek professional medical care. Your physiotherapist or sports doctor can usually confirm the diagnosis of Achilles tendonitis in the clinic. They will base their diagnosis on your history, symptom behaviour and clinical tests. Achilles tendons will often have a painful and prominent lump within the tendon. Further investigations include US scan or MRI. X-rays are of little use in the diagnosis. The first thing to do is to cut back your training. If you are working out twice a day, change to once a day and take one or two days off per week. If you are working out every day cut back to every other day and decrease your mileage. Training modification is essential to treatment of this potentially long lasting problem. You should also cut back on hill work and speed work. Post running ice may also help. Be sure to avoid excessive stretching. The first phase of healing should be accompanied by relative rest, which doesn't necessarily mean stopping running, but as I am emphasizing, a cut back in training. If this does not help quickly, consider the use of a 1/4 inch heel lift can also help. Do not start worrying if you will become dependent on this, concentrate on getting rid of the pain. Don't walk barefoot around your house, avoid excessively flat shoes, such as "sneakers", tennis shoes, cross trainers, etc. In office treatment would initially consist of the use of the physical therapy modalities of electrical stimulation, (HVGS, high voltage galvanic stimulation), and ultrasound. Your sports medicine physician should also carefully check your shoes. A heel lift can also be used and control of excessive pronation by taping can also be incorporated into a program of achilles tendonitis rehabilitation therapy. Orthotics with a small heel lift are often helpful. Surgery can be done to remove hardened fibrous tissue and repair any small tendon tears as a result of repetitive use injuries. This approach can also be used to help prevent an Achilles tendon rupture. If your Achilles tendon has already ruptured or torn, Achilles tendon surgery can be used to reattach the ends of the torn tendon. This approach is more thorough and definitive compared to non surgical treatment options discussed above. Surgical reattachment of the tendon also minimizes the change of re-rupturing the Achilles tendon. By properly training the body, an athlete can build the strength of their tendons and muscles. Following a workout and dieting plan, the body will be able to build muscle and strengthen most effectively. Additionally, doing the following can prevent tendinitis. Wearing appropriate shoes will give your foot the support it needs for proper movements of the foot and ankle. Improper movements will put additional stress on your body. Stretching before an athletic activity, Stretching primes the body for a taxing activity. Additionally, this will get your blood flowing and reduce the risk of pulling a muscle. Ask your doctor about orthotics, Custom orthotics can help get your foot into proper alignment. If the foot does not execute proper mechanics, the body will adjust which will cause pain and increase the chances of injury.